Designer and entrepreneur Lela Lee is the creator of the slightly off-beat and refreshingly original retail company Angry Little Girls. With a boost in business and a plan to relaunch her brand, Lee came to us needing distinct custom packaging. Lee wanted packaging for her smaller gift items like jewelry, socks, and books. 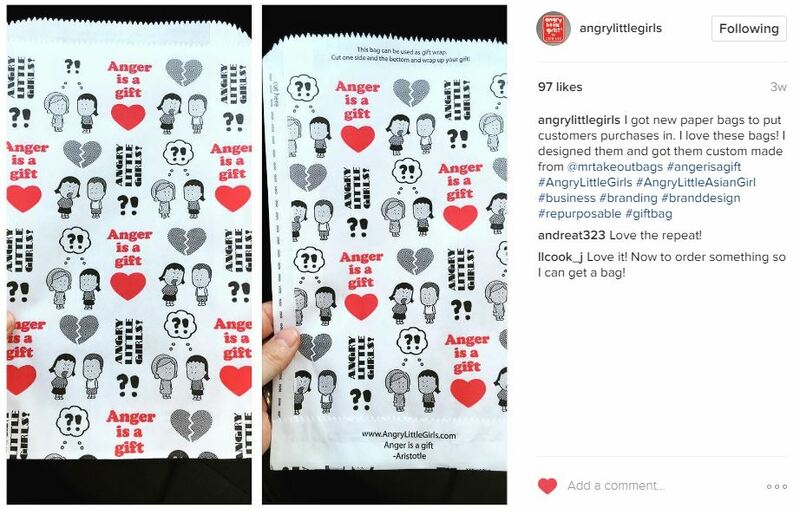 What she wanted was a merchandise bag that customers could cut and use as wrapping paper when gifting. And we found a way to turn this inspired design into a reality. We were very excited to work on this project with Lela because not only was it unlike previous jobs, it felt great being a part of her branding process. Lela Lee was so thrilled she posted an image of the custom bag on her Instagram! We worked with Lee to try to bring her ideas into fruition. By adding a simple dotted line along the edge, plus brief instructions, and the Angry Little Girls merch bag became suddenly reusable as giftwrap. And that’s another opportunity for Lee to get her company name seen. Did you know we’re a one-stop shop for many customers? That’s because we customize a wide range of items, and we carry stock items as well.